Author: Alexander, Tasha Set In . . .
For Emily, accepting the proposal of Philip, the Viscount Ashton, was an easy way to escape her overbearing mother, who was set on a grand society match. So when Emily's dashing husband died on safari soon after their wedding, she felt little grief. After all, she barely knew him. Now, nearly two years later, she discovers that Philip was a far different man from the one she had married so cavalierly. His journals reveal him to have been a gentleman scholar and antiquities collector who, to her surprise, was deeply in love with his wife. Emily becomes fascinated with this new image of her dead husband and she immerses herself in all things ancient and begins to study Greek. Emily's intellectual pursuits and her desire to learn more about Philip take her to the quiet corridors of the British Museum, one of her husband's favorite places. There, amid priceless ancient statues, she uncovers a dark, dangerous secret involving stolen artifacts from the Greco-Roman galleries. And to complicate matters, she's juggling two very prominent and wealthy suitors, one of whose intentions may go beyond the marrying kind. 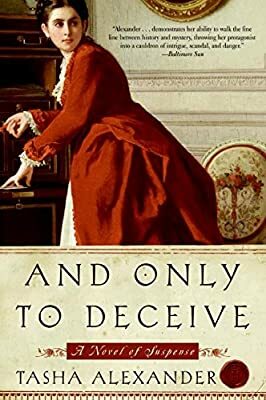 As she sets out to solve the crime, her search leads to more surprises about Philip and causes her to question the role in Victorian society to which she, as a woman, is relegated.